The upwards march of passive market share seems unstoppable. But there are reasons to think why, in some institutional segments at least, market-cap passive share may peak soon. 2018 was a tough year for active asset managers. Market volatility hurt profitability while the spectre of customer migration from active management to passive had a major impact on share prices. 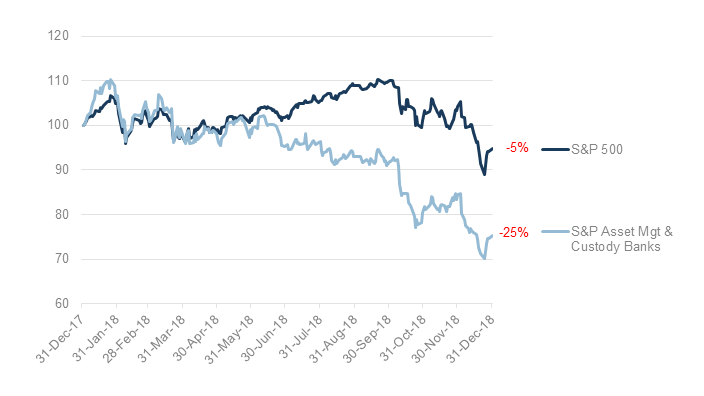 As Figure 1 shows, share prices of asset managers underperformed the overall market by roughly 20 percentage points in 2018. The rapid advance of passive and the dominance of inflows by passive managers has raised concerns about effects on market efficiency; and whether systemic risks might exist in the form of three dominant passive managers. However market dominance is rarely long lasting. For passive management – defined here as traditional market capitalisation-based – there are reasons to think the passive peak (at least in terms of share of flows) may be in sight. While the prevailing narrative has been customer migration from active to passive management, it is clear that this is an over-simplification. Alongside active to passive migration has been migration from active to factor management. Equally notable is that active to passive migration may turn out to be an active to passive to factor migration (or sometimes back to active). Passive management is not always the final destination in a migration away from traditional active management. As with passive, factor approaches offer the potential for significant fee reductions relative to active management, but additionally with the potential to capture systemic risk premia, and better understand the underlying risks of a portfolio. This is a strong value proposition. While factor investing is still early in terms of overall penetration of asset owners, for those which do take it up, it tends to become a third pillar of equity portfolios alongside, or even replacing, active and traditional passive strategies. More generally, market cap is just one way to slice and dice the market in a systematic manner. There are a range of well-accepted factors (value, low volatility etc), and many other ways to codify a rules-based approach (equal weight, fundamental weight and so on). As a group, these alternative approaches will likely make inroads to the current dominance of market cap passive. NMG’s Global Asset Management brand tracking study and thought leadership studies have tracked the evolution of ESG investing from the fringes to a mainstream activity which asset owners take increasingly seriously. 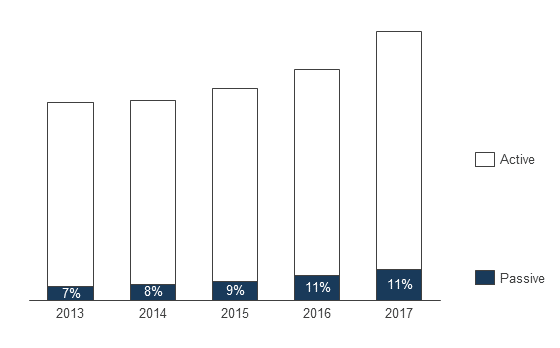 Consideration and adoption are spreading through North America and APAC; into other segments such as insurance; and from equity portfolios to fixed income and other asset classes. While there is demand for specialist ESG products, ESG increasingly manifests in requirements for mainstream equity and fixed income mandates. Asset owners are starting to screen out asset managers which have not integrated ESG into their investment and business processes. There is limited consensus on what ESG means in practice, whether it is a return and / or risk factor, and how to best implement. Both active and systematic approaches are feasible – but not necessarily traditional market cap passive. ESG-modified versions of market cap passive are of course one solution – but this is already a deviation. When an asset owner is small, its public markets portfolios usually represent a tiny proportion of capital markets, and the use of active management is unlikely to disturb trading volumes or have any market impact. As an asset owner gains scale, it may run into diseconomies in active management, particularly if located in a nation with small domestic capital markets and / or it is using active management in niche asset classes such as small caps. Weight of money reduces the potential success of active management and can incentivise a transition to passive management. This can switch again when an asset owner becomes very large (>US$100bn). This sort of scale is often associated with the buildout of internal investment teams seeking to capture benefits of scale. This is most evident in private markets where scale can help with large asset ticket sizes and capturing illiquidity premiums. But it can also be the case in public markets, where a certain scale allows an asset owner to take strategic public company stakes or fund major transactions. Such an asset owner may not be highly active in terms of portfolio management, but it’s certainly not passive. These “peak passive” trends are most visible at the top end of the institutional market. In retail and wholesale investor segments, including the UK, evolution is at an earlier stage and the dynamics are different. As Figure 2 indicates, the passive market share of contestable AUM in the UK retail advised market is still only just over 10%, and passive’s share of inflows indicates that AUM penetration rates will increase further in the medium term. For active managers, near-term competitive pressures will remain significant even if the peak passive hypothesis plays out. However it’s important to recognise that there are growing countervailing forces to the active-to-passive narrative. These forces represent emerging challenges for passive managers, and equally emerging opportunities for active managers able to harness them.